It is one of the enduring ironies of my life that although my initial experience with the stock market – choosing Howard Johnson for a school assignment in a year when the stock sank and the company was sold – was negative, I eventually found my way into a reasonably successful career working in the industry. That said, I work with people who choose stocks, and don’t actually choose them myself. The only reason I recognized the Howard Johnson company name at all was that my mother and I ate there, exactly once, when she took me there for a very big treat. The ice cream! I’m not sure I ever saw one of Howard Johnson’s famous bright orange roofs, since the one we went to was in the ground floor of a Manhattan building. The restaurant seemed a bit beat-up, and the waitress was not friendly like the waitress at the VFW fish fry in Wisconsin, who was also the school crossing guard and admired my pigtails while I played tic-tac-toe with my grandfather, who never seemed to win no matter how hard he tried or how many hints I gave him. My mother and I sat in a booth and ate our meals, and then had ice cream, which was probably okay but not special enough that I remember it. I liked the ice cream from the Baskin-Robbins near where we lived; one flavor had pieces of frozen bubble gum in it, and at Halloween, they had licorice-flavored black ice cream that tasted awful but disgusted my mother so much that I looked forward to ordering it every autumn. If it were not for my fifth-grade school project, I don’t think I’d remember Howard Johnson at all, but as it happens, I remember it well: An inauspicious beginning to my future career. 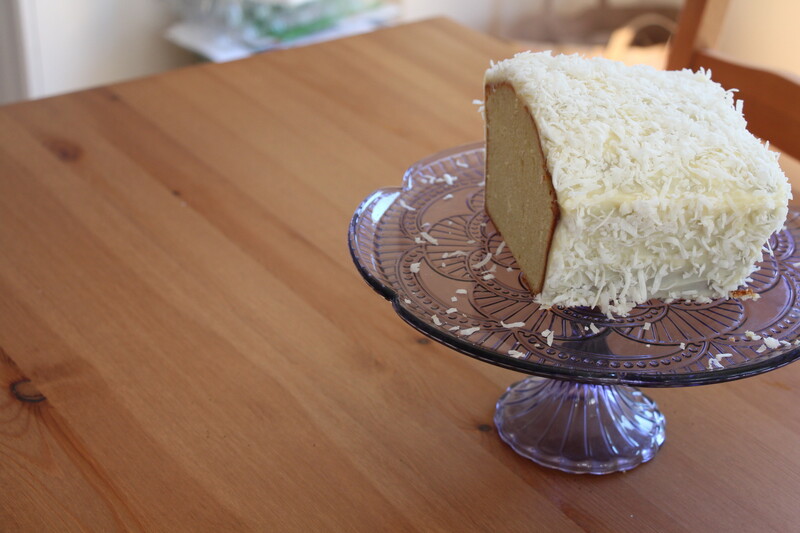 It makes me smile, and so it was that when a recipe for the original Coconut Loaf Cake sold at Howard Johnson appeared on the King Arthur Flour blog, well, I had some coconut and some free time and plenty of nostalgia, so I made it. It was superb: A buttery loaf cake, dense but not heavy, with a hint of coconut. I didn’t include any additional coconut flavoring, so the flavor is there, but only from the coconut – not overpowering at all. The frosting is just divine with a bit of tang to it, and should not be omitted – there isn’t enough coconut without it. Cool the cake completely before frosting it (I mean it!) and then press in as much shredded coconut as the frosting will hold. Use all the frosting, and be generous with the coconut. Plan to be sticky. Lick fingers thoroughly when done. The Child was less impressed than I was, explaining to me that she would like it, if she liked coconut. I thought she did like coconut; at least, I can’t come up with another reason why Kate Smith’s Coconut Squares are her most-frequently requested cookie. Apparently, that was a few years ago and I need to keep up. It was because of her that I discovered one of the nicest features of this cake: It refrigerates really well. This should be surprising, since the original was apparently sold frozen, then thawed and served at home. The cake kept really well in the fridge and tasted divine served cold. It’s an ideal summer cake in this regard – a sweet, cold treat for a hot summer day. Preheat the oven to 350°F. Lightly grease a 9" x 5" loaf pan. Make the cake: In the bowl of a stand mixer fitted with the paddle attachment, beat the butter at medium speed for about 10 seconds, then gradually add the sugar. Beat for 2 to 3 minutes, stopping once to scrape down the sides of the bowl, until the mixture is fluffy. Add the eggs one at a time, beating each in completely before adding the next. Scrape the bottom and sides of the bowl, and beat briefly, just until combined, then add the salt, baking powder, and vanilla. Add the flour to the bowl in three portions, alternating with the cream. Beat at low speed, just to combine, after each addition. Stir in the flaked coconut, and scoop the batter into the prepared loaf pan. Bake the cake for about 70 to 75 minutes, until a toothpick inserted into the center/top of the loaf comes out clean. Tent it gently with aluminum foil if it appears to be getting too brown. Remove the cake from the oven, let it cool in the pan for a couple of minutes, then turn it out onto a rack. Cool completely. Make the frosting: Mix the butter and cream cheese at low speed, until thoroughly combined, then beat in the sugar and salt until smooth. Place the cake on a large piece of waxed paper. Spread the frosting all over the cake. Pat the flaked coconut onto the frosting. Plan to get sticky, or use a piece of wax paper. Be generous with the coconut. Cake keeps well in the refrigerator, and may be frozen.